A tincture is a concentrated liquid herbal extract. It is typically made by soaking herbs and other plant parts in alcohol for weeks to extract the active constituents. Alcohol is considered an excellent solvent because it is food grade and can extract herbal constituents (such as resins and alkaloids) that are poorly soluble in water. After a period of weeks, the herbal mixture is strained and the herb parts are removed, leaving behind the concentrated liquid. Tinctures can be made from a single plant or a combination of plants. Fresh or dried leaves, roots, bark, flowers, and berries may be used to make tinctures. The plant part depends on the species of plant. Herbal tinctures are sold in health food stores, some drug and grocery stores, and online. Although many tinctures can be taken orally, some tinctures such as arnica and compound tincture of benzoin should only be used externally. The plant parts are carefully sorted so that any unwanted parts are removed. The herbs may be chopped coarsely before being placed into a glass jar. The jar is filled with alcohol, capped tightly, and allowed to sit for weeks. It may be shaken regularly and the jar may be topped up with alcohol if necessary. The plant material is strained and removed, and the liquid is typically poured into small, labeled, glass bottles with dropper tops. If dried herbs are used to make the tincture, a common ratio is 1 part dried plant material to 4 parts liquid (1:4 ratio). If fresh herbs are used, a common ratio is 1 part plant material to 1 part liquid (1:1 ratio). The alcohol used in commercial herbal tinctures may depend on the type of herb. Herbs with water-soluble constituents are best extracted with a lower percentage of alcohol, while other constituents can only be extracted with higher levels of alcohol. Commercial herbal tinctures often use a pure alcohol solvent made from corn, grape, wheat, or cane and distilled at or above 190 proof. Herbalists sometimes make herbal tinctures in small batches using vodka (80 to 100 proof). Sterilized dark amber glass bottles are classic tincture bottles. The dark glass protects the herbs from ultraviolet light. The bottle and dropper are made of glass because plastic can interact with the alcohol in the tincture. Since tinctures are concentrated extracts, the dropper helps to measure small amounts of the tincture. 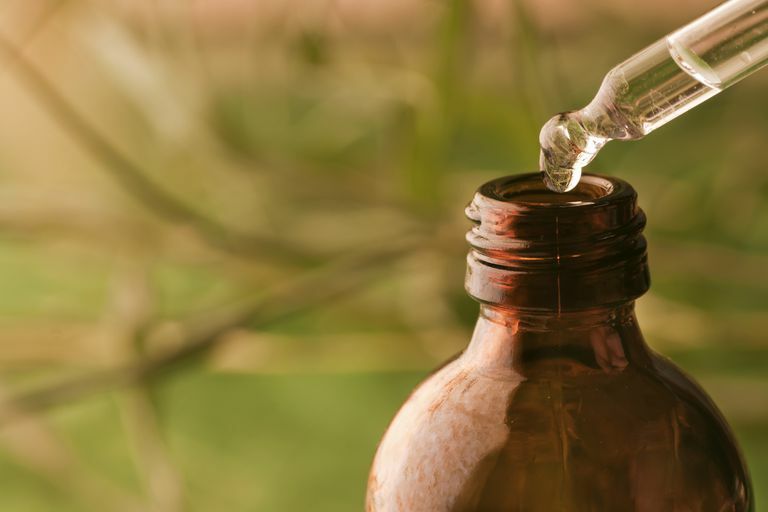 Here's a look at tinctures that are sometimes used in herbal medicine. Also known as cannabidiol, CBD is a non-psychoactive chemical found in marijuana. Proponents suggest that the use of CBD tinctures may help to alleviate migraines, seizures, anxiety, menstrual pain, and other types of pain. CBD tinctures are considered fast-acting and potent, particularly when the tincture is placed under the tongue. A common component of first aid kits, tincture of benzoin should only be used topically. Benzoin is a hard resin produced by trees, and the tincture is often used to help first aid adhesive bandages and wound closure strips stay in place. It is also said to protect the skin from contact allergy to the adhesive and reduce irritation. A substance produced by bees to build beehives, propolis is being explored for its effects on allergies, gastrointestinal disorders, allergies, gynecological, oral, and skin disorders, according to a report. Elderberry fruit contains anthocyanins, a type of a type of natural pigment with antioxidant properties. Consuming elderberries (and other dietary sources of anthocyanins) may reduce chronic inflammation, according to a report. Echinacea remains one of the most frequently used herbal products among older adults, according to a 2017 study. A review of previously published clinical trials found that some echinacea products may be more effective than a placebo for colds, but the overall evidence was weak. Turmeric (Curcuma longa) is a spice widely used in cooking. The active component in turmeric is curcumin, a substance said to have anti-inflammatory and antioxidant properties. A study published in the International Journal of Rheumatic Diseases, for instance, found that curcumin could have beneficial effects on knee pain and quality of life in people with osteoarthritis of the knee, however, it was less effective than ibuprofen at relieving pain. Although it may be tempting to make your own tinctures, some plant parts are considered toxic and may be harmful. For example, elderberry bark, leaves, and root contain a compound that can release cyanide. Some plants contain potentially toxic compounds known as pyrrolizidine alkaloids. In addition, certain plants may be contaminated such as pesticides and heavy metals. There is a lack of research on many of the tinctures that are commonly used. If you're considering trying one, consult your health care provider to discuss whether it's appropriate and safe for you. Karsch-völk M, Barrett B, Linde K. Echinacea for preventing and treating the common cold. JAMA. 2015;313(6):618-9. Onakpoya IJ, Spencer EA, Perera R, Heneghan CJ. Effectiveness of curcuminoids in the treatment of knee osteoarthritis: a systematic review and meta-analysis of randomized clinical trials. Int J Rheum Dis. 2017;20(4):420-433. Can White Birch Fight Cancer?